and she is bringing out her newest book in October 2011! I love her style and for some time now I wanted to introduce her to the people who don’t know her. 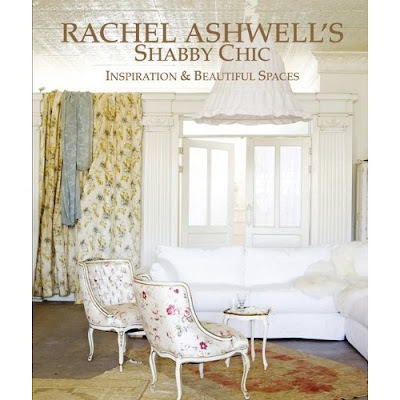 I first heard about Shabby Chic when we where living in Texas. What I love the most is the way she uses her fleamarket finds in her styling. I became a Shabby Chic lover! I just like someones work but I’m not really interested in the person behind it. But with Rachel it’s different; I admire her strenght and her insight as a designer. Maybe it has something to do with her move to a different country and starting a business. but I know I truly love her work and her as a person. Some years ago, I was in Malibu and I went to her store. Seeing the Shabby Chic brand come to live was amazing. bought some items and I was hoping that I would bump into her…. She wasn’t there but a few months later, I met her in Paris on a trade fair and I acted really stupid…. As if she didn’t know it herself….sigh…. I couldn’t believe she was standing right in front of me. Honestly, my mouth…. But she didn’t mind and she was really sweet! go here and order her books with great photo’s in them. I know what I’m going to ask for my birthday gift…. Oh yeah, I think this one will finds it’s way into my bookshelf! What a great story! I think I would be having the same reaction if I were to meet Rachel! I have all of her books and this is news to me…a new book!! How wonderful! She and her books have really influenced me in the style of my home. I can’t wait for more inspiration! Thanks for a great post, Maureen! How lovely that you finally got to meet Rachel! Did you say, “OMG, I’m your biggest fan!” LOL! I think most of us would have been just the same on meeting someone we really admired. Enjoy the rest of your weekend, Maureen. ik zou een mailtje met je link naar je Lief sturen, je kunt het maar beter gezegd hebben;)! Ik ken Rachell wel, althans…..van “het merk”dan he……ik snap wel dat er HEEL veel mensen gecharmeerd zijn van haar stijl en ik zie ook wel dingetjes die me aanspreken, maar voor mij persoonlijk mag het IETS stoerder….maar hee……wie ben IK om Rachell advies te geven he;))) wat goed is moet je goed laten!! How wonderful that you got to meet Rachel ~ great story. I have her last book which I love and I might have to get this one too. You made me laugh with the tale of meeting Rachel, I will check out her website. Love her too, and her books are divine. Haven’t forgot the magazine Coast, but we are all packed up now so it will be a few weeks until you get it!!! I’m always looking in Target for her stuff, but rarely see any. Maybe someone is beating me to it! Rachel should be paying you for advertising! I’m afraid I would act the same way, I’m sure she loves it. How lovely, a new book. I love her…better head to the bookstore! Did you get the book yet? Emma.